still in the Soviet Union. in the visa application process. to them in their old age." communities at the Diplomat Hotel. 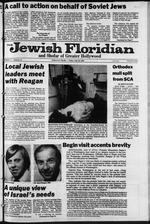 Federation of South Broward President Dr. Philip A.
lawkins of Florida, and Congressmen E. Clay Shaw Jr.
ol Florida and Jack Kemp of New York. issue ol obtaining freedom for Soviet Jews." nerves, as well as the early onset of multiple sclerosis. House will take place as scheduled. the official sojourn in Washington. reasons. This was denied by sources close to the premier here. over the visit at the present time. ment of the Israel Defense Force in Lebanon. go public appearances before Jewish groups. factory outcome of the Lebanon war. he is not at the peak of his form at this time. for the Agency. Dulzin said. Czechoslovakia with Jewish organizations abroad. tablishment of the State of Israel. in in this new era of assimilation"
kept her real feelings inside. United Way of Broward Countv. Keith Kronish, Vice President, F.D. Tradition. Itfc what makes usjews. respond to questions and autograph his books. (10% Diicount if Purchased Prior to October 31, 1983). their lives, willingly or unwillingly. needs of Jews who live in those communities. Contest, funded by the Morris J. 1 nounced on June 23 by Robert E.
Loup, UJ A National Chairman. age 23: Samuel C. Fleischacker. University, age 22; Harman M.
College of Pennsylvania, age 23.
me and to my colleagues," Mr.
Zvi Levavy, president of the M.
summer, from Aug. 11 to Aug.
for fees you can afford. on Aging as of July 1, 1963.
sources on the local level. religious belief or in a prayer." practice was quite the opposite." 13. a D 03 Been hospitalized or confined in a convalescent care facility or similar facility during the past six months? c Q OB Arthritis or any other condition or disorder that impairs your mobility or restricts your activities? d O S3 Any mental disease or disorder of the brain? Stieoar. Eiacutiva Dlraclor Sumnar O. Kaya. Submit malarial tor publication to Stava Kalon. Miwbir JTA. Saoan Arta. WNS. NEA. AJPA. and FPA. since the death of his beloved wife, Aliza. That everybody knew about it. maw of its erstwhile secrecy? and show what he could do. home rather than in jail cell*. Gore looks like a sure winner. versity in New York City. himself out of the race. man, Ted Stevens of Alaska. has been in my . kmm ate pmtmy^nmk. Serves 4. Save You Money. Check it out Compare! Sweet and Delcious, Fresh and Crisp. And. 6 PACK 12-OZ CANS DIET PEPSI. PEPSI LIGHT. MT DEW. 'SaPACKISVOZ CANS 000 FOOO ^ ****. 2 LTR BTL OCT COKE, SPRTTE. The Jewish Flortdian-and Shofar of Greater Hollywood *"
South, New York, N.Y. 10016. Impact Series. 1980. 90pp. $8.90. Gold* Mek. By Mollie Keller. Avenue South, New York, N.Y. In The Comfort Of The CatskHls! participants as glaringly at fault. joined the Allies in World War I.
promise of a Jewish homeland. Jewish in outlook ana tone. reads each page with excitement. warring with her own nature. Center Library, Roslyn, N. Y.
I R. WE1NRAUB & Co., Inc.
make you feel like the most important star of al! PLUS "OLO TIMERS" GAME with .mime gmsts"! dismissed his lawyer, Leonid M.
Popov, and will defend himself. msCARIDE-I. SEPTEMBER 17, FROM MIAMI. ploying ond singing oil their hits. cabin, upper and lower beds. Port-ou-Prince. Port Antonio, Gtond Caymon ond Cozumw. prison after an 18 month interval. | OPENS AT 5 P.M.
TODAVI I city state zip. Creator we forget that equal weight was granted to each tablet. prophecies when he foretold the destruction of Jerusalem. further and further into depression and desperation. Sidney E. Morrison, Jr. M.D. Sinai office 1201 Johnson St.
purchased prior to Oct. 31.
ple Beth Ahm. 9730 Stirling Rd. Heidi, daughter of Mr. and Mrs.
ously Temple in the Pines). for the Jewish community there. .
ish community of Lower Saxony. Congregation Levi Yitzchok Lubavitch. 1504 Wiley St.,. Temple Beth EjI 1361 S. 14th Ave., Hollywood; W04225. SSSLb^SC Pi2e": l-8638. Rabbi Bennett Greenapon. rung, 10:30 o'clock. Religious school: Pre-scbool-12. during two days of play. A* abort ear Cw**M**HtY rW*. lenges facing the people of Israel. Jewish settlers in Judea and Samaria. forged strong bonds of brotherhood. ton, in order to protest the action. trict met with the Hiliel leaders. In Dade, 945-3939. In Broward, 742-6000.
ward Countv for all our citizens." of 441) for July and August. and Friday, 9 a.m. to 9 p.m.
Jewish settlers that followed it. Every Saturday and Sunday the fabulous 'Tun Ships". challenge the odds in a full gambling casino..